This article provides information on how to configure your Active Directory Federation Services (ADFS) for use with Education Perfect's Single Sign-On (SSO) system. The steps and screenshots in this article are for Windows Server 2016, but similar steps should be possible on other versions. Open AD FS Management from Administrative Tools. 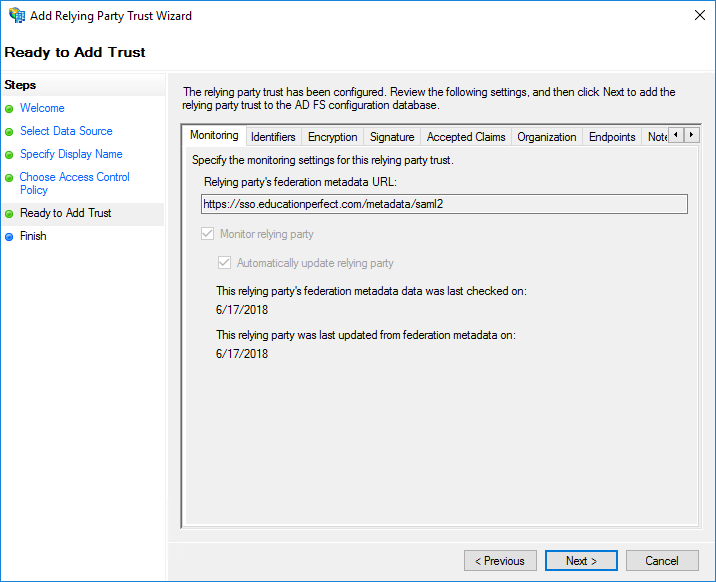 Right-click on Relying Party Trusts and select Add Relying Party Trust. This will open the Add Relying Party Trust Wizard. On the Welcome screen, select Claims aware, then click Start. On the Select Data Source screen, select Import data about the relying party published online or on a local network and enter Education Perfect's metadata URL (https://sso.educationperfect.com/metadata/saml2) in the Federation metadata address text box, then click Next. On the Specify Display Name screen, enter a display name for the Trust and add any desired notes about the Trust, then click Next. 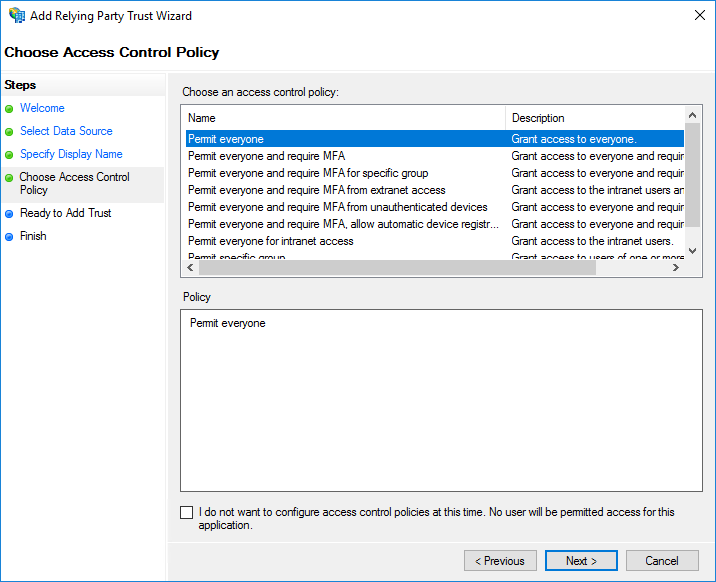 On the Choose Access Control Policy screen, select the appropriate Access Control Policy for your school, then click Next. On the Ready to Add Trust screen, the configuration will be loaded from our metadata. Click Next. Leave the Configure claims issuance policy for this application box ticked and click Close. 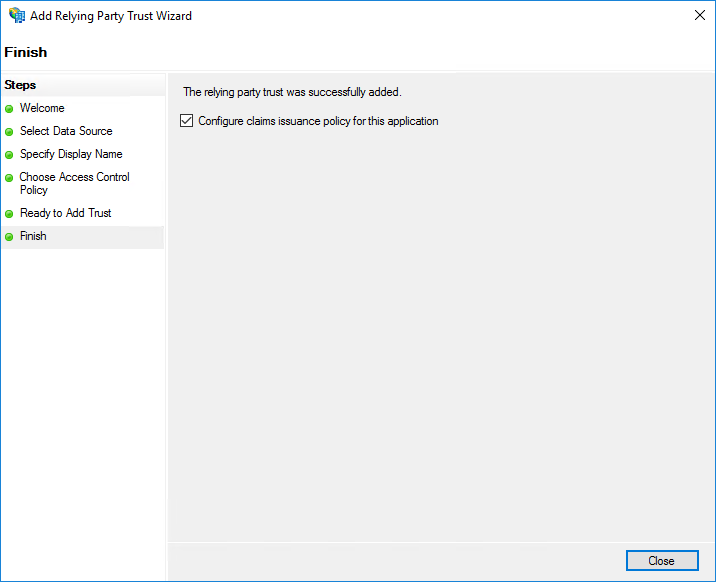 The Relying Party Trust will now appear in the list under the Display Name you specified in step 5. Right-click on the entry for Education Perfect and select Properties. 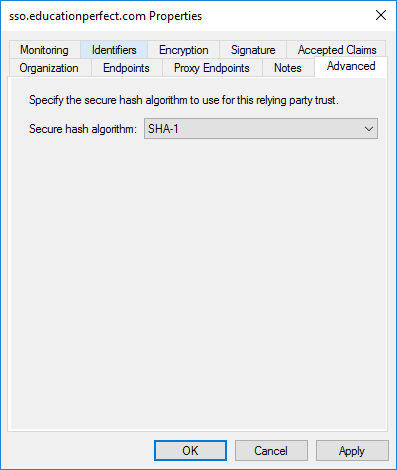 Change the Secure Hash Algorithm to SHA-1 and click OK.
Education Perfect requires a unique value provided by the ADFS server to be associated with each user in our system. The most common scenario is to provide a unique value stored in Active Directory, such as the user name or email address, as the unique identifier. 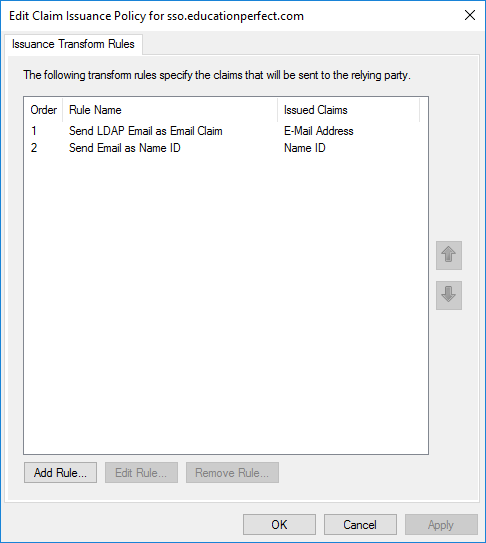 The following is an example of how to set up Issuance Transform Rules for the Claim Issuance Policy that supplies the user's email address as the unique identifier. Right-click on the entry for Education Perfect and select Edit Claim Issuance Policy. Set up a rule to retrieve the user's email address from Active Directory and send it through as the email address claim. 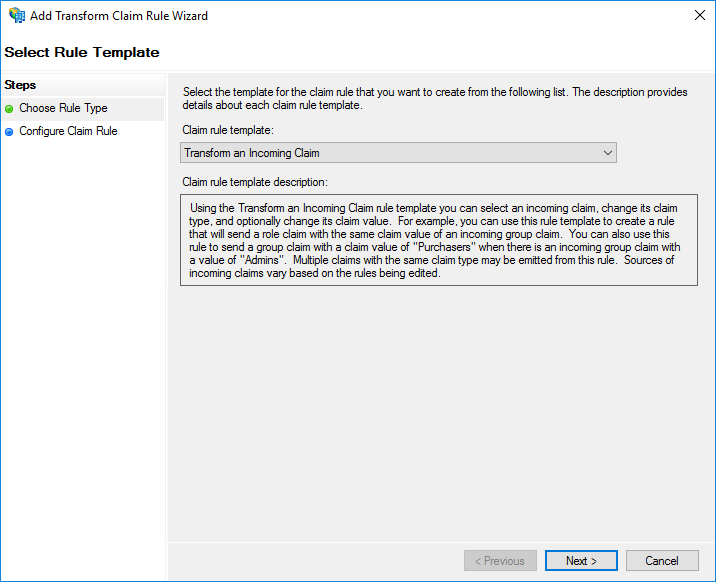 Click Add Rule, this will open the Add Transform Claim Rule Wizard. 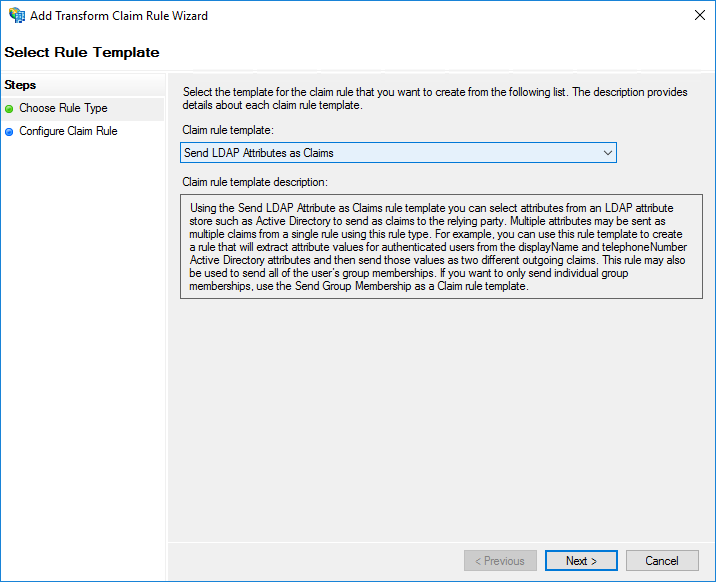 On the screen, select Send LDAP Attributes as Claims from the Claim rule template list, then click Next. 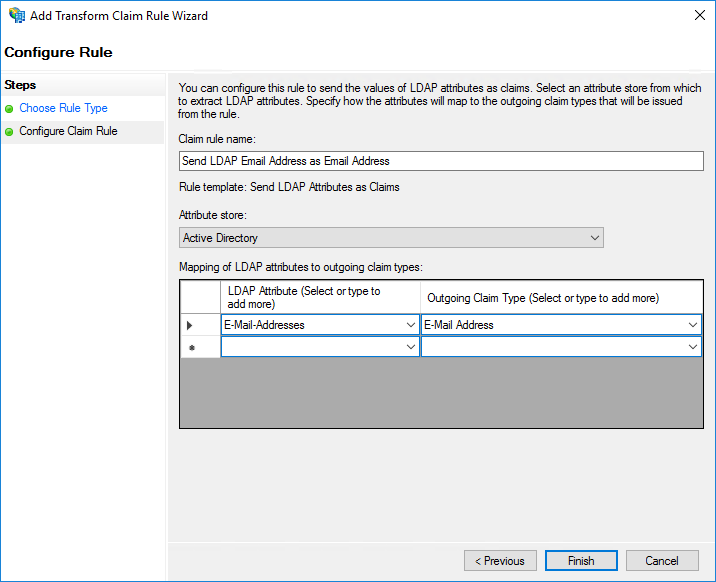 Enter a name for the rule, such as "Send LDAP Email as Email Claim", in the Claim rule name text box. Select Active Directory from the Attribute store list. Under Mapping of LDAP attributes to outgoing claim types, select E-Mail-Addresses from the LDAP Attribute list and E-Mail Address from the Outgoing Claim Type list. Click Finish. The rule will be added to the policy. Next, a second rule needs to be set up to use the email address claim as the Name ID. 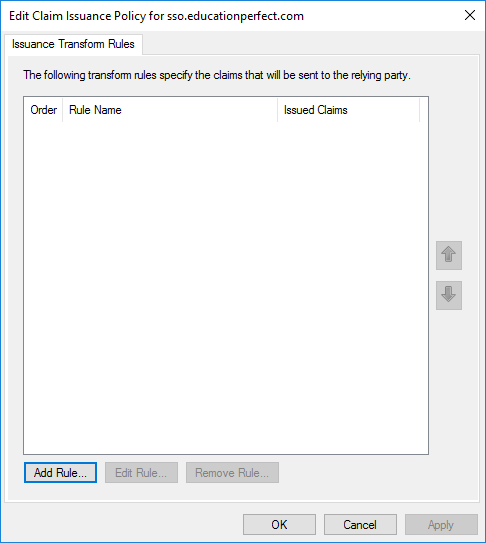 On the Choose Rule Type screen, select Transform an Incoming Claim from the Claim rule template list, then click Next. 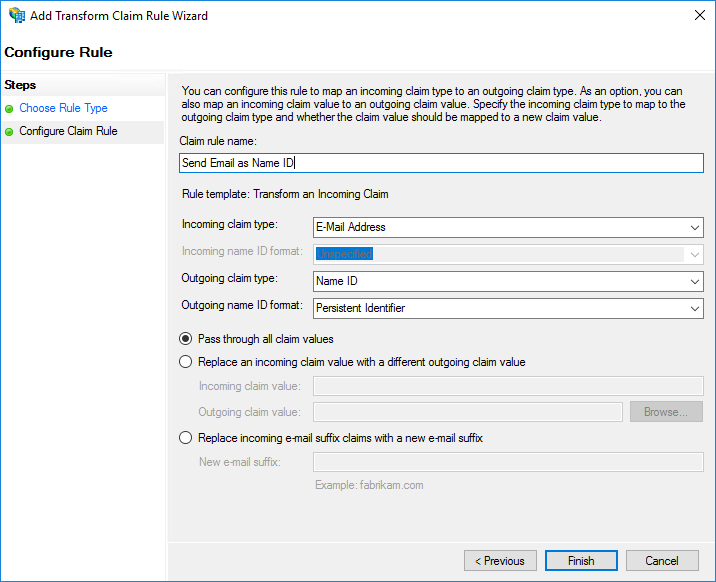 Enter a name for the rule, such as "Send Email as Name ID", in the Claim rule name text box. Select E-Mail Address from the Incoming claim type list. 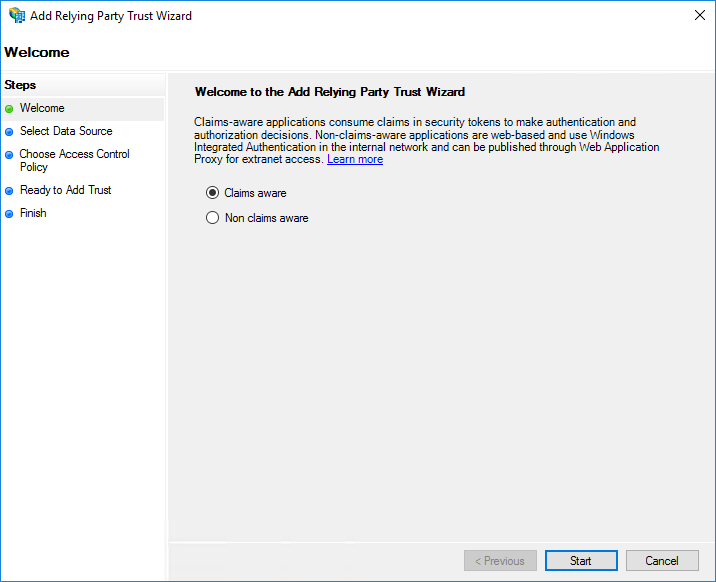 Select Name ID from the Outgoing claim type list. Select Persistent Identifier from the Outgoing name ID format list. Select the Pass through all claim values option. 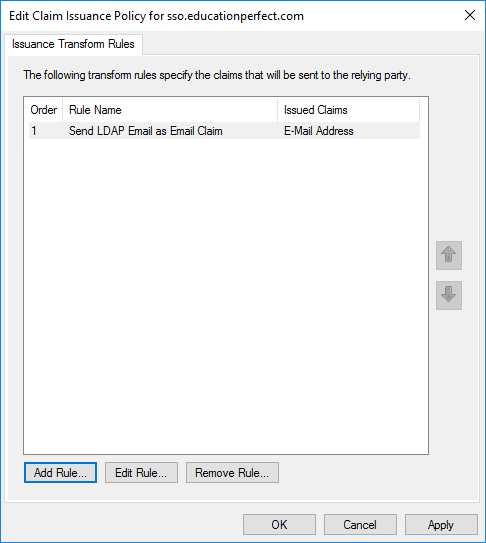 Verify that both rules are showing in the list of Issuance Transform Rules in the order in which you created them, then click OK.
You can either send us the URL or a copy of the XML itself. Login credentials for a test student and test teacher account so that we can check the integration is working. Please ensure that these credentials match the conventions in place for your other users.